Performing certain actions in Checkbox requires that you have access to other admin users in Checkbox. For instance, if I want to share my survey with another survey admin, I first need to have access to that admin so I can add him to my survey Access List and share my survey with him. Likewise, if I’d like to send my survey invitation to a certain User Group, I need to have access to view that User Group in order to add it to my invitation. 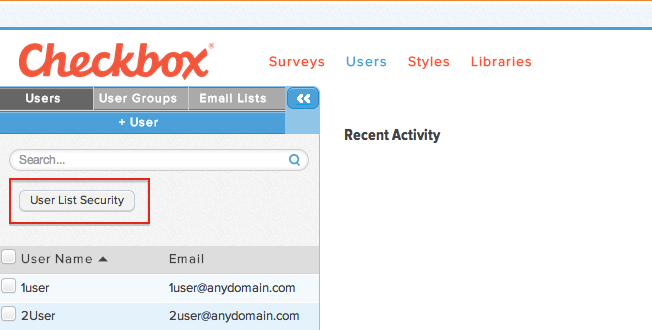 Checkbox works this way to allow segmentation of users and user groups. For instance, as a System Admin of a large account with many users, I might want to segment my admin users into groups by department. I want my Marketing Dept. to be able to share surveys amongst each other, but not be able to share access with the HR Dept. Allowing the Marketing Dept. users to only have access to other users in their own department would allow me to keep this separation. This guide will cover how to give your User Admins, Group Admins and Survey Admins the ability to see, edit, administer, and give survey access to existing Groups and Users. By default, non-System Administrator users do not have access to view or manage all the other users (what we refer to as the “Everyone Group”) in the application. Giving someone access to the Everyone Group allows them to – you guessed it – see and have access to everyone in Checkbox. How much access they are given depends on 1) their user role and 2) the access level assigned in the steps below. For example, if I give my Survey Admin, Steve, access to the Everyone Group, he will be able to see all users in the application for the purposes of sharing his survey with them. However, he won’t be able to edit or delete those users because he is a Survey Admin and not a User Admin, and therefore doesn’t have any user administration privileges. 2. Click the User List Security button to open up the Everyone Group access list. 3. Go to the Add Users/Groups to Access List tab and click a User or User Group name on the left to move it to the right this will give that User or User Group access to ‘Everyone’ in Checkbox. 4. 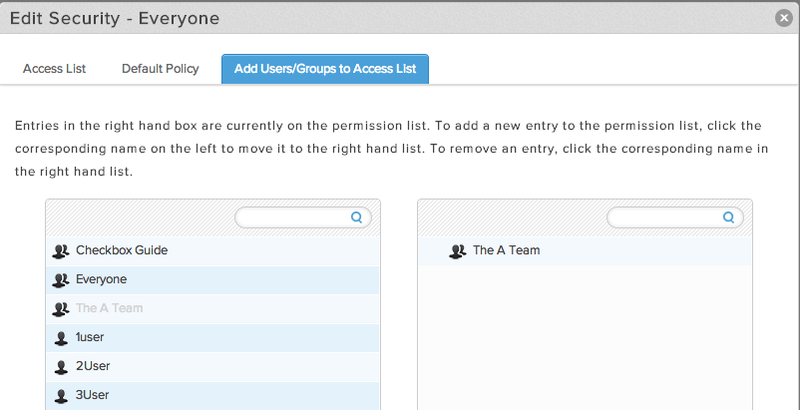 Click the Access List tab to increase or limit that User or User Group’s access to the ‘Everyone’ Group. Click ‘Save Changes’. NOTE: The user’s role will override the permissions of the Access List if the role allows for fewer permissions than the Access List. In other words, as in my example above, if I add Survey Admin Steve to the Access List and give him permissions to edit users in the Everyone Group, he still won’t be able to do that because his role of Survey Admin doesn’t allow him to create, edit or administer Users. Adding him to the Everyone Group only allows him to see all users and groups for the purposes of sharing his survey. You might be thinking, ‘What if I only want to give my user access to certain users and not to everyone in Checkbox?’. For instance, if your entire company uses Checkbox and you have a User Admin or Survey Admin in the Marketing Department, you might only want to give them access to administer or share surveys with the Marketing Department. No problem – you can do this in much the same way as you would give someone access to the Everyone Group. 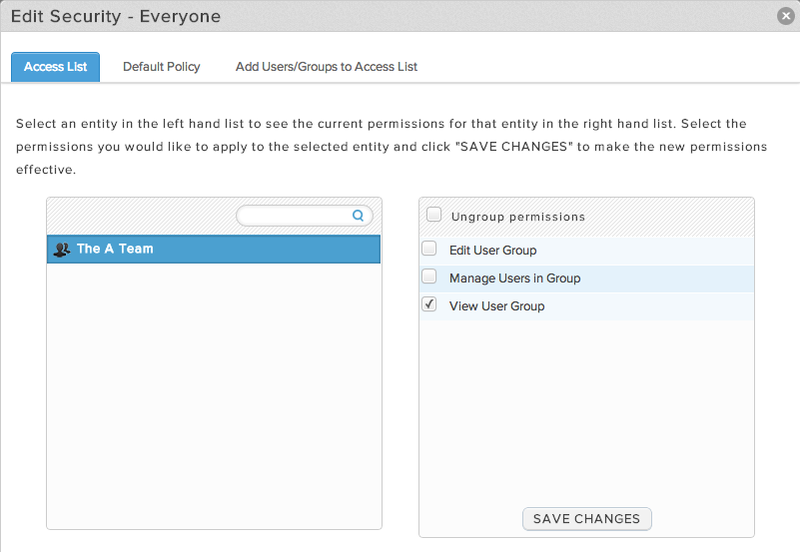 Simply follow the steps above except, instead of clicking the User List Security button to access the Everyone group, simply choose a User Group from the User Groups list and click Group Actions -> Permissions. Then follow steps 3 and 4 to add users to the Access List for that group.